Before this review can start, I need to disclose some information regarding my XBox 360 overheating and eventually causing the dreaded "red ring of death" which sends shivers down the owners of XBox 360 consoles. Even though my XBox 360 was in a well ventilated place, it did have overheating problems and became quite warm during gaming and DVD playback. This caused games to freeze and the machine would crash and eventually, the XBox 360 failed to power-up and three disheartening red lights appeared near the power button, indicating hardware failure. My XBox 360 was dead! Fortunately, Futuretronics have come to the rescue of XBox 360 owners with their XBox 360 Cooler Fan that will hopefully prevent the above scenario from occurring. The Futuretronics XBox 360 Cooler Fan basically connects to the back of your console to increase the air supply to the gaming machine in order to minimise heat retention and increase the longevity of the unit. 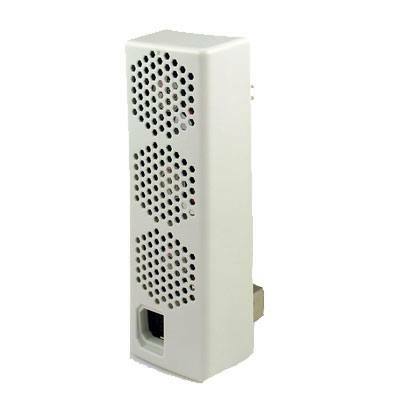 The installation of the XBox 360 Cooler Fan was a breeze and it simply connected to the back of the console without any issues whatsoever and once the power cable was connected, the unit was ready to be turned on. We were pleasantly surprised of how quiet the additional fan was on the XBox 360 but needless to say, this is one investment that all XBox 360 owners should endeavor to have. In conclusion, the Futuretronics XBox 360 Cooler Fan is probably one of the best third party accessories for the next generation of consoles that really cools the console and prevents overheating & hopefully any hardware failures. With a recommend retail price of $24.95, this device is available at all god retailers. Highly Recommended! For those wishing to know the conclusion of our XBox 360 problem, the unit died basically a week after the warranty expired and fortunately Microsoft still honored the warranty and replaced the unit in around two weeks. The moral of the story is that prevention is always betters than the cure. Thumbs up for Futuretronics and their XBox 360 Cooler Fan!